I had been hearing the reviews about Alma and finally scheduled a date with some friends. After all of the accolades (Best New Restaurant of the Year by Bon Appetit magazine and Ari Traymor being named one of Food & Wine magazine’s Best New Chefs of 2013), I was very excited about this meal. Alma offers two tasting menus each night – a 5-course tasting menu for $65/person and a larger one (9 courses) for $110/person (+$55/person for wine pairings). We decided to splurge and go for the big tasting menu, and we were ready to see what was on the menu using ingredients grown in their own Flower Avenue garden, as well as local farms that they work with. Our meal started with little “snacks” – ocean trout, roe and parsnip, mini english muffin with uni, burrata, fennel and roe and tofu and yuzu fritters. The ocean trout was a perfect balance of flavors and textures and the bellini with uni left us wanting more. 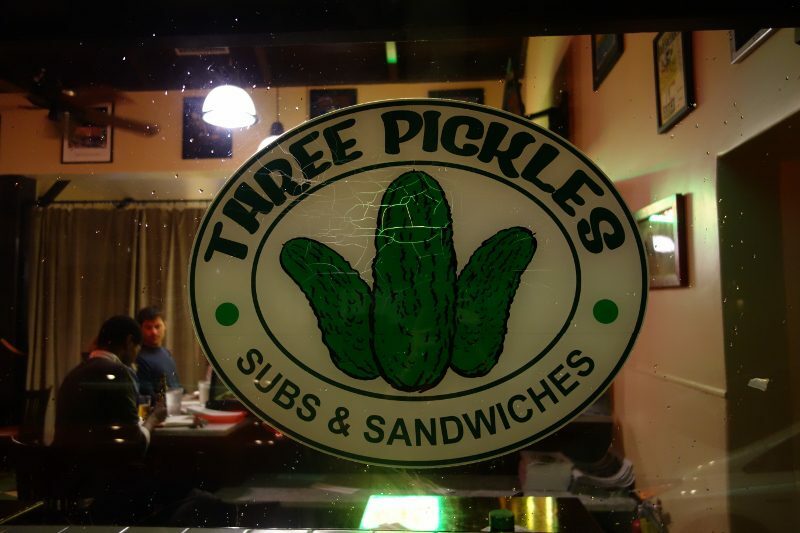 By day, Three Pickles Subs and Sandwiches is a popular deli in downtown Santa Barbara, with a second location in Goleta. Lunch is served daily from 11am – 3pm and next door is the recently opened the Pickle Room, a classic cocktail bar next door.